My second entrance in Chile was quite different than the first one. If the first time I saw a very sparsely populated Chile, exploited by the mining industry, this time, entering by the Agua Negra Pass, I find myself in Chile’s center, a little bit north of it’s capital, Santiago. If the climate is still very dry, the human canalized the water from the rivers to transform the valleys in green little oasis. 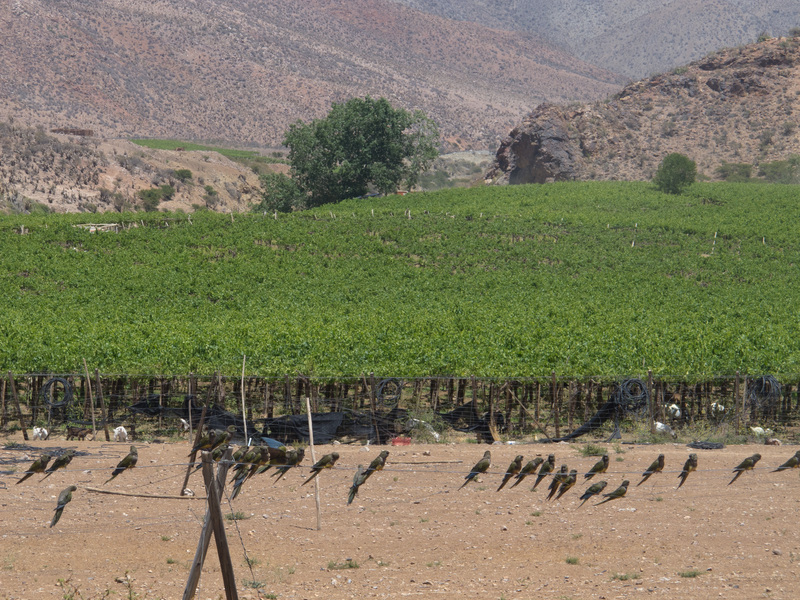 The Elqui valley is renowned for it Chilean pisco production, so here I am cycling through grape fields until Vicuña. The generosity of my hosts and the comfort of their house in Vicuña make the city as a very good place for a resting day. I plan my way to Santiago. Instead of taking the main road along the coast, I’ll take a network of small country roads that will bring me to the capital. Flat roads where quite rare, getting out of the green valleys to climb the dry hills of the Coquimbo region. If cities like Illapel and Ovalle with their industrial look haven’t attracted me, the villages on the way were quite charming. The Chilean farmer proudly wear it’s not very high but quite large beige hat, saying me “hola” from the top of their horse while passing by them. South of Illapel, from the village of Limáhuida, the road becomes thiner, but less steep. It’s actually a former train track transformed into a road in the 40s, characterized by numerous tunnels sometimes longer than a kilometer. A section goes through a quartz deposit, finding some through the gravel on the road. 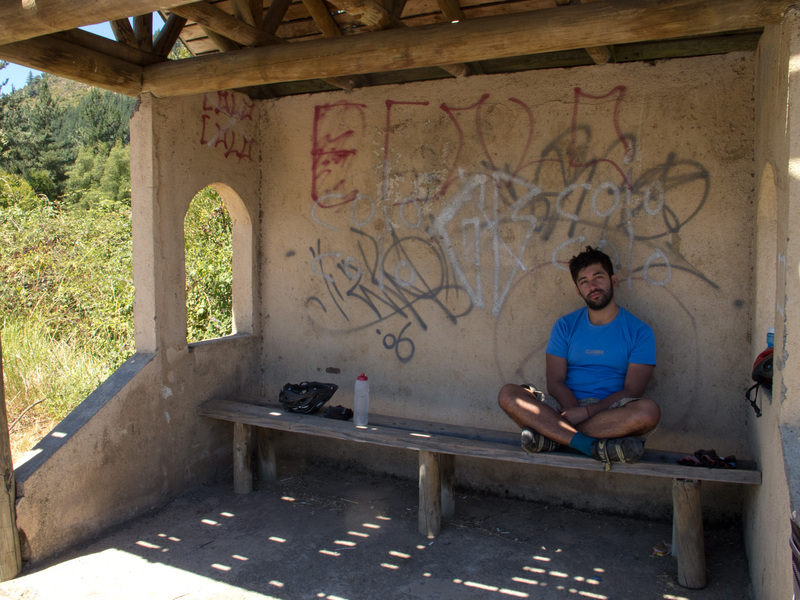 Just before the tunnel that will bring me in the Valparaíso region, a family invites me first to get some water, then offered me a place to set up my tent, a then finally gave me a bed. 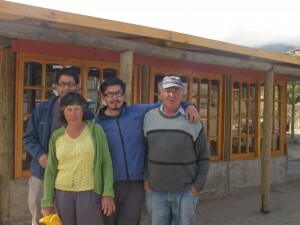 I shared great moments with them, chatting with their sons who went to backpack in Patagonia. 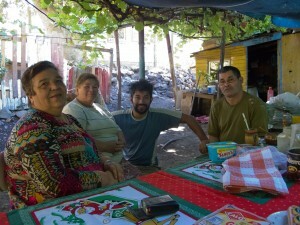 The generous Chilean hospitality goes on the next day, while I arrive in a town named Puteando. No campground, but I enter into a centro turístico, a events hall with restaurant a swimming pool, to see if I can set up my tent not too far. It was Sunday and the employees were finishing their busy week-end. Immediately, I find myself around a table with them, sharing their meal and answering their many questions about my trip. I realized that Chileans are quite curious about their South American neighbors; elsewhere, not very often people were asking questions about the other countries I visited. From Santiago starts a long break that will give me the opportunity to get closer from friends and family. The trip will take more than the planned year and a half. 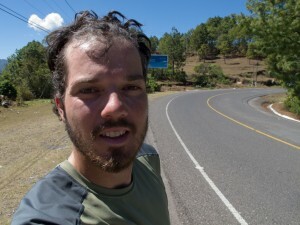 It’s the number of kilometers that I badly planned; I was thinking making 27.000 kilometers to Ushuaia, but here I am in Santiago with 26.500 done, with still about 4.500 kilometers to do. Haven’t thought that I’ll make so much detours on the way! And if I take more time, let’s take more time for real: I hope to arrive in Ushuaia before the end of April, before the winter gets to though. 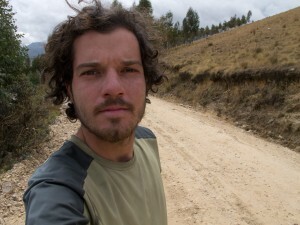 It’s in Santiago that Guillermo, met previously in Colombia, join the adventure. The second day of February, here we are on the road, due South. While for him starts a brand new journey, I almost see Ushuaia in the distance. Together, we starts our days without knowing how they’ll finish. We cross large fields of heavily-developed Chile, meeting a host that will bring us to a natural reserve close to Rancagua, then spend a day and a half on the speedway to eventually leave it and take countryside hilly roads. We camp in an eucalyptus plantation, beside a dam’s reservoir and on the yard of a primary school, spending the night with the lady living beside, who invited us to have a drink with the family. The next day, we stamp our passport and start the climb to Paso Pehuenche. The Maule river, which gives its name to the region, is liberated from its lower cement canalization and we can finally appreciate it naturally. The first day goes well. The two first weeks out of Santiago represent almost a quarter of everything that will have to be climbed until Ushuaia. It’s not necessarily a easy start for Guillermo. Even though there is no more pass over 3.000 or 4.000 meters, the border with Argentina is at 2.500 meters elevation here. 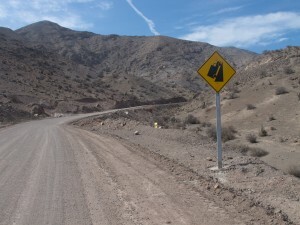 Chilean roads are quite steep. Not as much as Ecuador, but let’s say that Chilean engineers haven’t always find the easiest way to go up and saved on asphalt. A quite good asphalt though. In a downhill along a lake, just before the last climb to Argentina, I avoid a few rocks felt from a small landslide. I make a sign to Guillermo behind to slow down and take care, which he does. Trying to avoid the first ones, he ran over smaller rocks, loosing control and finishing its run on a protection wall in cement. The racket of his fall and the explosion of his front wheel make me turn my head. I see over my shoulder Guillermo’s body spin on the cement wall, wandering later how he finished on the ground only with skin burns on his arms. I forget to look ahead two seconds too much, my bicycle hits a little cement step on the other side of the road and I land in sand. 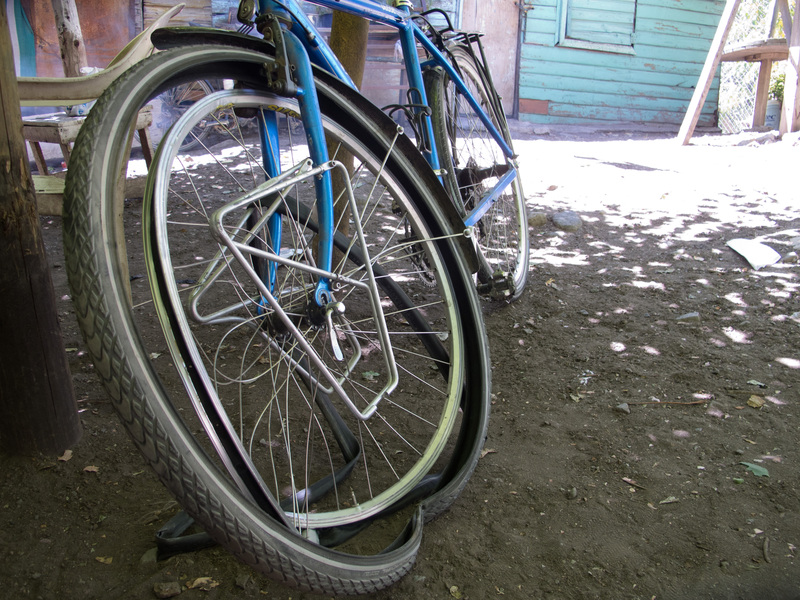 My front wheel doesn’t survive neither. I immediately runs toward Guillermo to see if he’s intact. His helmet is cracked, but is body and spirit are answering. 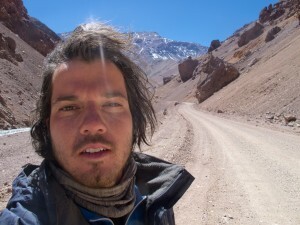 Here we are ten kilometers from Argentina, in the cordillera’s no man’s land, without wheels and a bit shattered. We gather all the parts and try to hitchhike back. Fortunately, the third car passing by can take us and our bikes. We come back to the custom station, at Alicia’s place beside the school, the lady that hosted us a couple of days ago. We leave our stuff there and the next day, we go down to Talca, a 150 kilometers further, with our front wheels that look like nothing good, with the hope of finding something equivalent. I spend the day walking the city twice, finding the best I can in different shops, while Guillermo stays close to the terminal finding a solution to his wounds getting infected. The heat is unsupportable, and we are quite happy to go back in the cordillera, staying at Alicia’s place an other day to disinfect well Guillermo’s wounds and put the bicycles back in order. The next day, a truck bring us back to the lake and we take back the road a little bit before where we left it. Where we got the accident there were that day a team taking care of cleaning the road from the rocks. Here we are finally in Argentina. We could add quite a few sentences about this event, thanks the one somewhere who takes care of us or find reasons and metaphorical learnings about our misadventures, but I’ll summarize in three words: put your helmet. This entry was posted in 14. Chile by CycloExpedition Americas. Bookmark the permalink.